His works are classic and modern at the same time and put their spectators into thoughts into an experience almost secret.” M.S. The bronze, its patina, the shaping of the metal, the shades that the fire or the hammer give to it, the final process of a difficult material, which surrenders in the hands of a stubborn and patient modern Hephaestus, create a unique total. “ M.S. Slowly you are driven by an, impressive construction, the specious illusionism of detail, the branches that the wind blows without a breath, and you are plunged into a forest of shapes that are flamed but not burnt.” M.S. 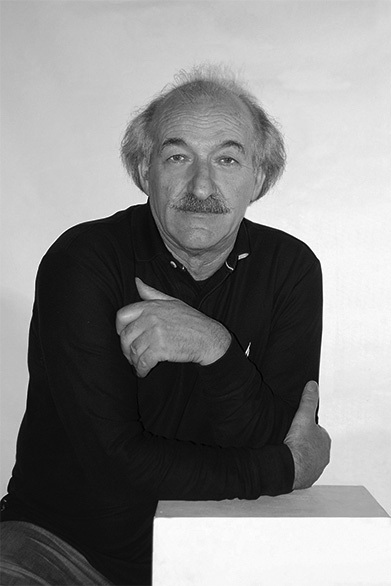 Angelos Panagiotidis was born in Amphilochia in 1950. 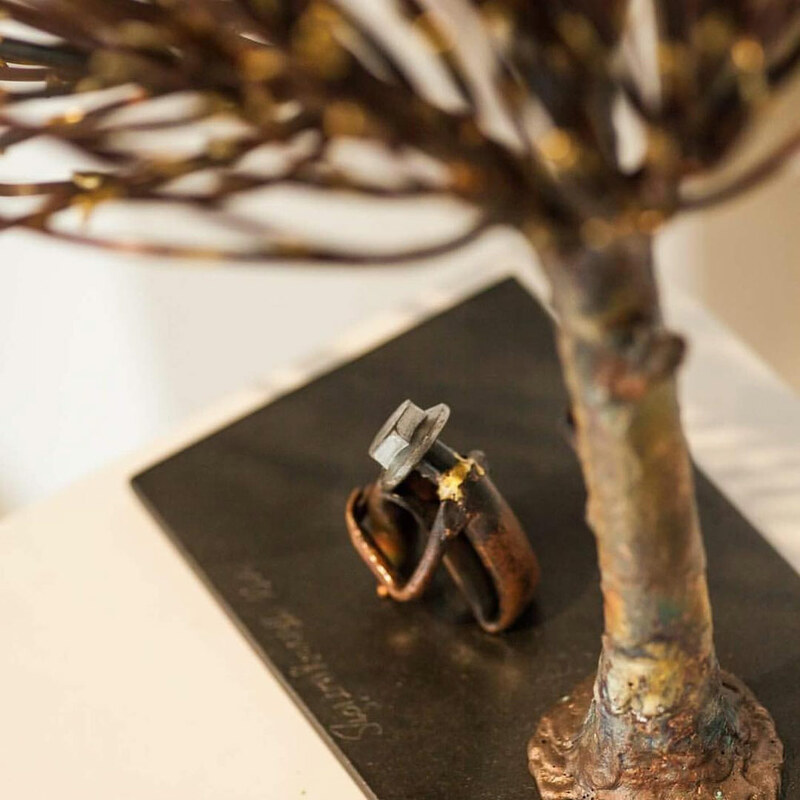 He held his first exhibition at his studio in 1990 after twenty years of experimenting with all the different metals used in sculpture. 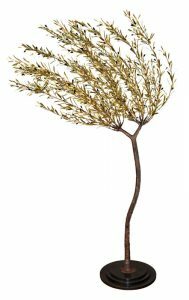 He had also dedicated much study to the natural world, particularly the structure and forms of trees, throughout all various stages of their lives and the various changes they undergo at different times and in different seasons. His research was conducted with the accuracy of a natural scientist, the passion of the cultivator and the style and taste of the poet. His profound knowledge of his materials, acquired over these many years of study, led him to create tree sculptures which hardly seem made by human hand. 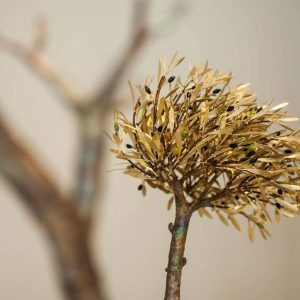 Now, after a series of exhibitions commencing in 1995, they are not only instantly recognizable but have come to be seen as classic representations of the tree in sculpture. The culmination of his creative career was the exhibition staged at the Titanium Yiayiannos Gallery as well as his participation at the same period in important exhibitions organized as a part of Olympiad: The World of the Olive exhibition at the Theofilos Museum in Vareia, Mytilene and at the Basilica St. Mark in Heraklion, Crete; the exhibition at the Olive Museum in Sparta; the “In Praise of the Olive” (Elaias Egkomion) exhibition at the Athens Academy and the event staged at the Plateia Nerou Esplanada (Delta Falirou) as part of the Coca Cola sponsorship of the Athens 2004 Olympics. With his artworks have been honored the Olympic Champions: Pyrros Dimas and Nikos Kaklamanakis, as well as the former chairman of parliament Apostolos Kaklamanis & Anna Psarouda-Benaki and the Greek National Polo Women Team. 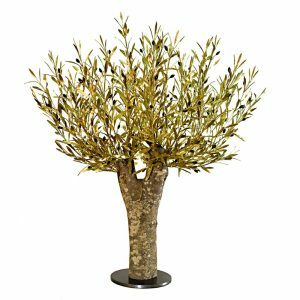 In May 2005 during the visit of Greek prime minister Karamanlis to the U.S. was given a bronze olive tree as a gift to President Bush. During the Olympic Games of Athens 2004 with gold olive wreaths awarded all three of the first Olympic Champions of the Marathon (the Italian, Stefano Baldini, the American, Keflezighi Mebrahtom and the Brazilian Lima Vanderlei). With the same wreath has been honored and the Slovak Matanin Marcel, whose entering to the Panathenaiko Stadium became a symbol of the end of the Games in Athens and an exponent of “fair play” (30/09/2004). Additionally, the Municipality of Amfilochia has honored with gold wreath the bronze Medal Champion in the 100 meters and fourth in the 200 meters, Paraskevi Katza. With olive branches honored the runner citizens of the City (10/16/2004). 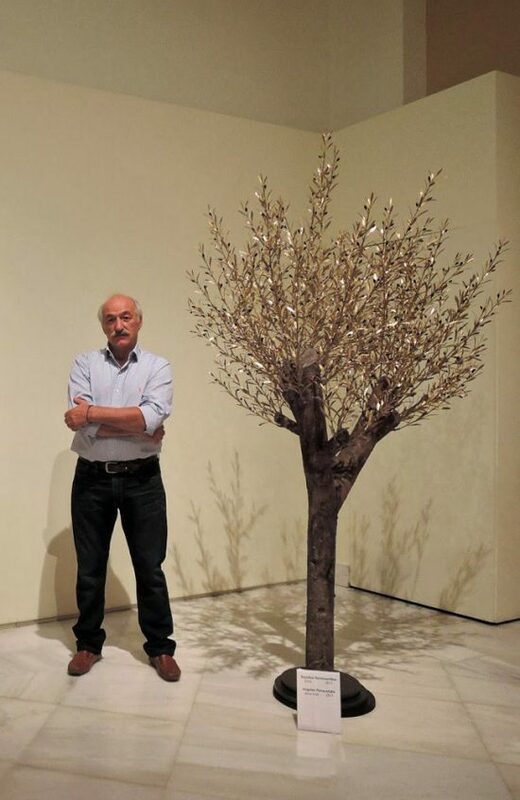 Angelos Panagiotidis is the creator of the “olive tree of Athens” which is made by bronze and copper, height 3.30 meters, consisting of 5,000 brass leaves which has been exposed throughout the duration of the Olympic Games in Athens in the Park Donor (Water Plaza) at the Palaio Faliro, where 5,000 guests put their signature on each of the 5,000 leaves of the tree. The art work permanently exhibited at Technopolis in Gazi. This was sponsored by the Coca Cola Hellas in the Municipality of Athens as a memorial tribute to the Olympic Games. 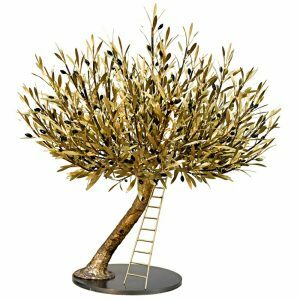 Finally all the Paralympians were honored with a small copy of the “Olive Tree, the tree of Athens. Works by the artist can be seen in the National Bank of Greece, the Bank of Piraeus, the Alpha Bank, the Center of Arts and Letters “Diexodos” in Messolongi, the Olive Museum in Sparta, the Olive Museum in Mytiline, the Olive factory in Dromonero, Chania, the Christos and Sophia Moschandreou Gallery in Messolonghi and in the headquarters of Coca Cola in Athens and in Atlanta. 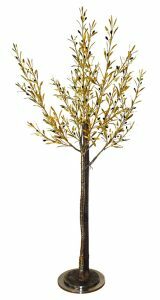 Also copies of artworks of the “Olive Tree, the tree of Athens” offered by the Sponsor of the Olympic Games, Coca Cola to the Olympic Museum in Lausanne and the Olympic Committee in Beijing. His works are still in the Security Council of the United Nations and the Ecumenical Patriarchate of Constantinople. The Goulandris Museum (Cycladic Art) permanently display and sell original works from the artist. Additionally artist’s works could be found in private collections in Greece and abroad. In 2003-2004 the artist has cooperated with the Greek Post Office and his works included in the collection of art objects. He has participated in over 150 group exhibitions in Greece and abroad. “Aggelos Panayiotidis works are classic and modern at the same time and put their spectators into thoughts into an experience almost secret. Slowly you are driven by an impressive construction, the specious illusionism of detail, the branches that the wind blows without a breath, and you are plunged into a forest of shapes that are flamed but not burnt. The bronze, its patina, the shaping of the metal, the shades that the fire or the hammer give to it, the final process of a difficult material, which surrenders in the hands of a stubborn and patient modern Hephaestus, create a unique total. This is an aesthetic Olive Grove that was created today to symbolize yesterday- a blessed time that we have thrown away- as well as tomorrow. A tomorrow that can t do anything else, but to take into consideration the environment and its needs if humans wish to continue their adventure on earth. Aggelos Panayiotidis, miraculously self-taught, selects the olive, the eternal symbol of an ideal society, a peaceful society that combines the happy work and the glorious works of culture to talk about things of immediate priority and tragic effects. I wonder, who does not understand the underground heartbreak of silent and tender art? In a period of crisis for sculpture and puzzlement for public monuments, the creator returns to an anti-rhetorical theme, a tree, a brunch, the olive s fruits and speaks thunderously without using words. Who does not hear him? As the time, during which we heralded innocent the ones that said they did not understand, has long gone. As no man without a sin exists. The work of Aggelos Panayiotidis, a ma tre of his kind, combines harmonically the sculpture shape, worked perfectly, with the painting effect, which plays with the color and the theatrical- delusional reshaping of the place. His trees, the trunks, the leaves and their fruits compose an aesthetics of unique energy. This is a silver-gold forest of small and large olives that travels at an imaginable sea and that it is vibrated by the tension of all those juices that are stifled in their trunks venations. With a symbolic sense it is a burning construction of a civilization in a world that is blazed by insanity. These are artistic shapes that are developed inside out- as it also happens in nature- and are flamed but not burnt. Since the miracle of art goes through them. That s why I talked earlier about comfort and relief. These trees, the trees of art will survive. Their goal will be to shape someday different people with such ideas that will love and re-birth the other trees- the Nature s trees which are reddened by human hostility. And this is great. P.S. The first Olive of the world grew in Acropolis. What a huge responsibility for us!